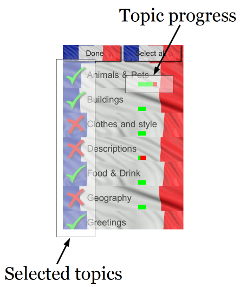 This page describes the Topics menu of the French Vocab Games app. it also displays your progress in each of the topics. As with any menu on the iPhone/iPad, use your finger to scroll or flick up or down to see other topics not currently visible (in the current version, there are approximately 20 topics in total). As you've probably guessed, the tick or cross by each topic name indicates if that topic is selected. You can have any combination of topics selected or unselected, provided that you have at least one topic selected by the time you press Done. The button in the top right will display Select all or Deselect all (depending on whether or not all topics are selected at a given moment) to help you with selection. In the Flash Cards activity, topics will be tested one after the other. How many "cards" are chosen from each topic depends on the number of topics you choose. If you want a more "in-depth" test, select just one or two topics to get tested on various items from that topic. If you chose a large number of topics, then you will only be tested on a handful of words from each topic to prevent each session of the activity from going on for too long! However, playing the Flash Cards multiple times will still allow you to test yourself on more vocabulary. In the Vocab Pairs activity, each set of 8 "cards" (or 4 pairs of French/English) is taken frmo the same topic. Note that when you have more than one topic selected, in any given game/activity, choice of items from the selected topics is weighted so that you get more practice at topics on which you have achieved a lower proportion of correct answers in previous games. Once a particular topic has been used at least once in an activity, a small bar appears next to the topic name, as illustrated opposite. 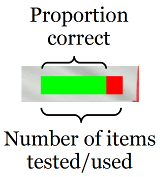 the proportion of the bar coloured green represents the proportion of correct answers on that topic in games and activities.